After almost nine months of motoring through the Solomons (the longest we have been in any country while on the boat, by the way), we finally got our parts installed, made the last minute dash to the market to buy as much produce and fruit as we could store, checked out and headed for Takuu. We saw every kind of sailing, from perfect beam reaching through flat seas, to downwind in heavy seas, and upwind into waves and rain galore (to say the forecast was a bit off may be a bit of an understatement). We made some rookie mistakes: Mark's hatch wasn't all the way closed so his mattress was soaked with sea water--first time we have had that happen in 4-1/2 years of sailing. Conrad tossed his cookies inside the cabin and didn't make it to a bucket right away. We also lost a lure to something huge that about ripped the bungee cord in half, let alone snapping the 150 lb test line like it was nothing. Ripe bananas from the humongous stalk that Matt couldn't refuse (less than $3 US) started plopping down as the boat moved from side to side (a la the Pacific crossing), so it's lots of banana bread for the next while. Takuu (Mortlock) is an atoll that is technically part of the Bougainville Independent government (which is itself nominally part of Papua New Guinea), though they get almost zero and are basically left to themselves. The inhabited islands are only a meter above the sea, so rising sea levels are a real concern facing the 200-300 residents and during very high tides some of the houses get inundated. The government wants the islanders to relocate, but many are reluctant to leave their home to move to a place with a different culture (Takuu is Polynesian in origin, while the rest of Papua New Guinea is Melanesian) and way of life. Our friends on Field Trip have been here for over a week and have making friends and fixing boats. We are enjoying the nice calm anchorage while we dry out Mark's bedding. Conrad turned 11 today (Matt made donuts to celebrate) and is itching to try out the new camera his grandparents got him. We had a fully sunny day for the first time in almost a week and we spent it exploring Rokana Nomana Island, near Lola Island. Zipolo Habu Resort's sweet spot is fishing and their skilled guides know where to find them. Most days end with the clients' catch being cleaned and the scraps being tossed to the abundant black-tip reef sharks that frequent the beach. The following shots show some of the action. 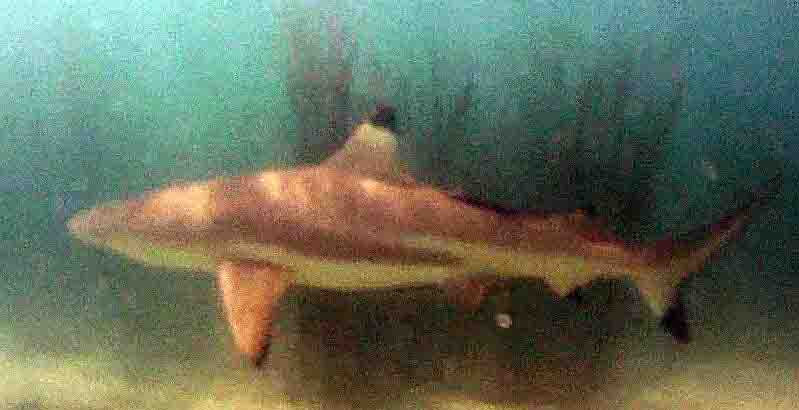 The pictures are a bit grainy because the sharks and fish kick up a lot of silt, plus they are just screen captures from an older Go Pro unit. Oh, you want 4k clarity? Go watch the National Geographic channel. We also don't have David Attenborough on retainer, in case you were wondering. The good news is that our roller furler finally arrived at the rigger in Australia. Woohoo!